*Redesigned for 2016, our most popular folding Adirondack chair offers the same great quality, with more slope in the comfy backrest, a deep seat, and an easy-gliding motion that is sure to make this new design one you'll love for decades. Design the perfect outdoor seating area this season with our Poly Adirondack Chairs and give yourself a million reasons to get outside and spend some time enjoying the splendors of Mother Nature! The simple folding design will allow these chairs to go anywhere and make for easy storage to give you room for outdoor activities when needed. Add the optional cupholder and you'll also have a place to rest your favorite beverage while you enjoy a leisurely afternoon enjoying the sun, or a cocktail in the evening as you stargaze! Also available, our Amish Handcrafted Side Tables or a Conversation Table add the perfect complement to your new Poly Adirondack Chairs to create a beautiful, designer look in any outdoor decor. The Amish Folding Poly Adirondack Chair comes in an array of beautiful colors, so you're sure to find the perfect chairs to match your unique decor! Customize this piece with a two tone color scheme to combine two of your favorite colors as well! It features stainless steel hardware that hinders rust and ensures that you get the most out of your invest in fine outdoor furniture from DutchCrafters. And, since it's backed by a 20 year warranty, you don't have to rely solely on our word - these chairs are going to be ready when you are, for decades to come! Our Folding Poly Adirondack Chairs are handcrafted by skilled Amish woodworkers in the heart of Pennsylvania's Amish Country. The materials they use in crafting their beautiful outdoor and patio furniture is a poly resin lumber that is commonly referred to as Poly; which is an environmentally sustainable, long-lasing and maintenance-free material that is manufactured using post-consumer recycled plastics. 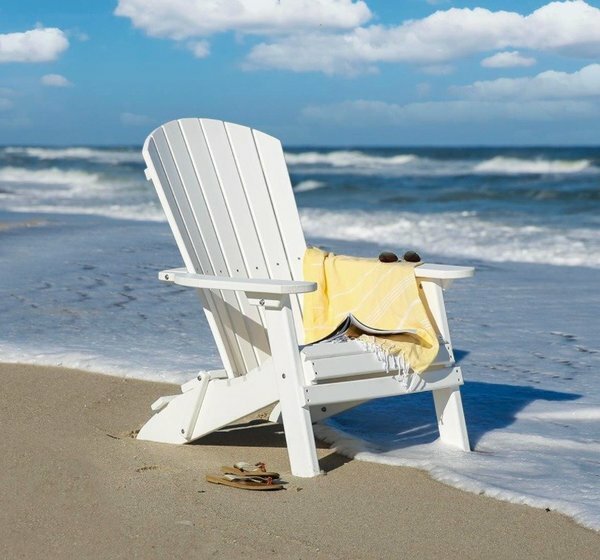 The bench-built quality of our Poly Adirondack Chairs allows for a highly durable chair that is built to last decades, even when constantly exposed to the elements! 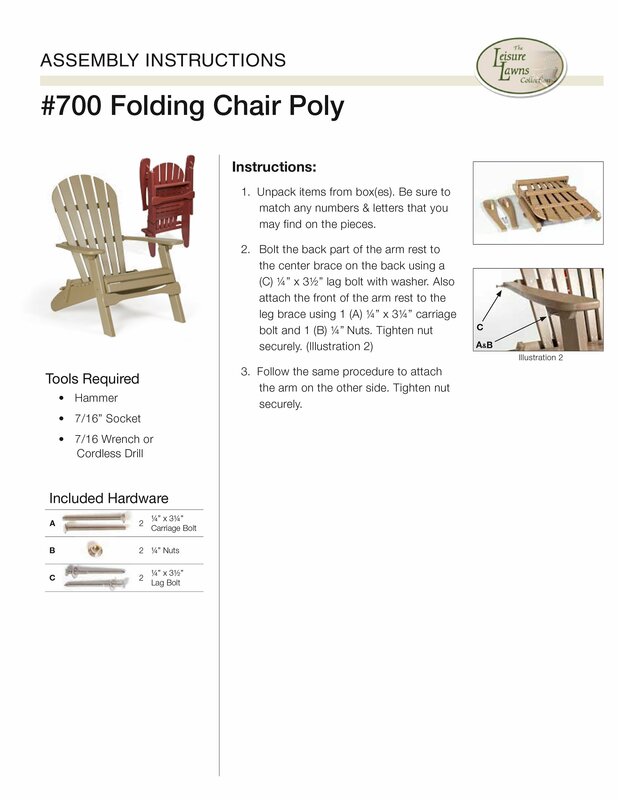 And, because they are folding chairs, the Poly Adirondacks can easily be moved from one location to another. It is portable - ideal for packing in an RV, transporting to a vacation home, bring to the beach or simply moving to the best patio spot during a certain time of day. Poly lumber is the perfect choice for outdoor living due to its superior construction. Poly furniture is not only eco-friendly (manufactured from recycled milk jugs) but our poly furniture is also American Made, weather proof and maintenance free! In other words, it is absolutely perfect for constructed your dream outdoor retreat! "I bought a pair of these folding Poly Adirondack Chairs for my own home in 2003 and more than a decade later, they are still our favorite outdoor chairs!" Total Weight - 45 lbs. Front Legs - 1 ½"
Slats for Seat & Back - ¾"
I just wanted to let you know how much I love the Adirondack chairs - they arrived today - the workmanship is outstanding - they are perfect - thanks so much. Thank you for your email. I received the polywood chairs yesterday and love them! Thanks!